Winding through 4,600 miles of forest and field, alongside river and railway, and over hilltops as well as fences is the North Country National Scenic Trail. Next week, the National Country Trail Association will be celebrating their annual meeting, a chance for volunteers and enthusiasts to come together in shared appreciation of this country-spanning marvel. North Country Trail veterans and newcomers alike will experience hikes which include river trails between Gooseberry Park and downtown Fargo to treks across the Tamarac National Wildlife Refuge. Non-hiking events include an illustrated history of the Red River Valley with Steve Stark, and a presentation by Ruth and Dan Dorrough who, little by little and over the course of 17 years, have walked almost the entirety of the North Country Trail. They will be completing their adventure during the weekend hikes. The trail was made possible through North Country Trail Association partnership with the National Park Service. Originally conceived in the mid-1960’s, the trail is a project years in the making, and still growing. Currently, over 2,600 miles of the trail’s 4,600 mile span is open to public use, but through the help of volunteers, more and more sections are becoming available. Tom and Mary Moberg have hiked and helped develop more than their fair share of the trail. Tom Moberg is rounding off a three-year seat as president on the NCTA board of directors, and is vice president of the local Dakota Prairie chapter of NCTA. Mary Moberg is a member at-large of the Dakota Prairie Chapter leadership team. Together, they’ve traversed sections of the North Country Trail in all seven of the states it runs through, as well as helping to build and maintain the trail in various places over the years. “We like to think of it as a park that’s 4,600 miles long and four feet wide,” said Tom Moberg. Developing the trail for public use takes a lot of work and a lot of planning. The first step for the North Country Trail was to determine just where it could run. A rough plan was initially mapped out before real development could begin. In the case of North Dakota, there comes an extra challenge in that only 4% of the land is publicly owned. The NCTA has to find private landowners willing to let the trail run through their property. From there, the proposed stretch of trail is hiked in order to determine where the interesting scenic locations are. Areas of historical and cultural significance are noted for future hikers to enjoy as they make their journeys across the trail. After the trail is hiked and choice spots selected, the area is developed. The prospective trail is mowed and smoothed out, and public amenities like rest stops and picnic areas are built. Where the trail runs into a fence, stiles are constructed to help hikers over, rather than installing gates that could accidentally be left open. “We have many styles of stile,” said Moberg. Other favorite sections of the North Country Trail include the Superior Hiking Trail, the area around Lake Champlain, and the Sheyenne National Grassland. Registration for the North Country Trail annual meeting is currently closed, but events along the trail are hosted often. 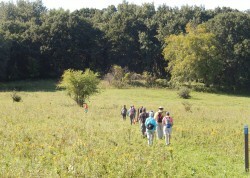 Those interested in exploring new locales can sign up for upcoming trips at http://www.meetup.com/red-river-valley-outdoors.